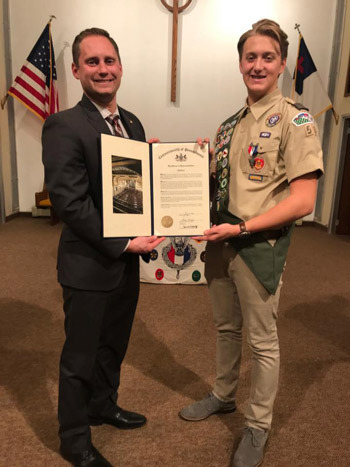 Last week, I had the honor of presenting a House citation to Jagger Bolton during his Eagle Scout Court of Honor at the United Presbyterian Church in Slatington. A member of Troop 58, Jagger is the son of John and Mandy Bolton of Washington Township. For his Eagle Scout project, he rejuvenated the fish hatchery in Slatington. Last Friday, I spoke at Career Day at Lehigh Elementary School. I talked about my work as a state representative and a member of the Pennsylvania National Guard. The children asked some great questions.